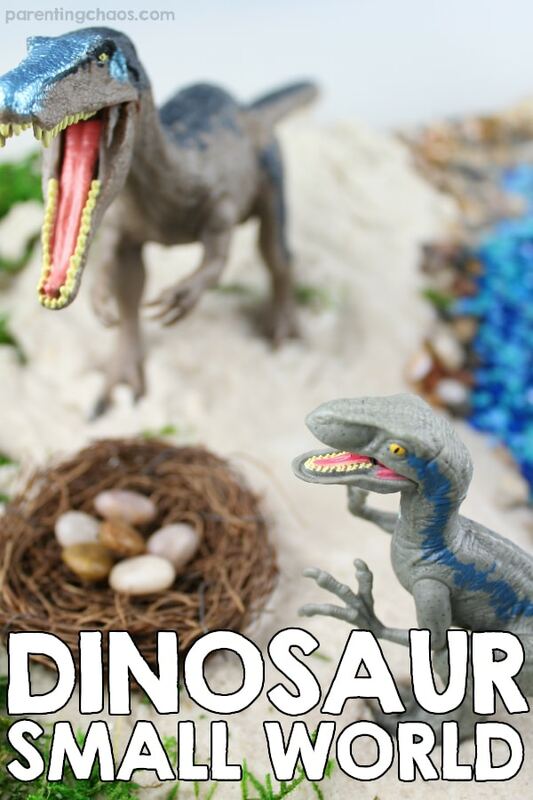 Explore dinosaurs through hands on play with this imaginative dinosaur small world! 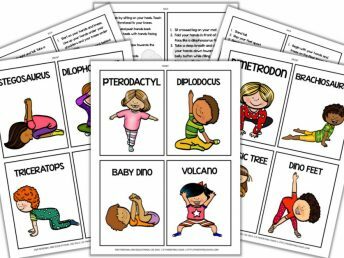 This is fantastic pretend play world is a great way to explore and discuss everything your kids have been learning during your dinosaur thematic unit! When we pulled this dinosaur small world out, my kids squealed with delight. There is just something magical about small worlds. As kids play with their dinosaurs in this habitat, the opportunities of what you can discuss are endless! What do the dinosaurs eat? What environment do they live in? What features does each dinosaur have (sharp teeth, three toes, horns, etc.)? Also, much like a sensory bin there are various sensory elements your child can explore and experiment with! Most of these items can be easily found at your local craft shop or in any store that sells floral supplies. 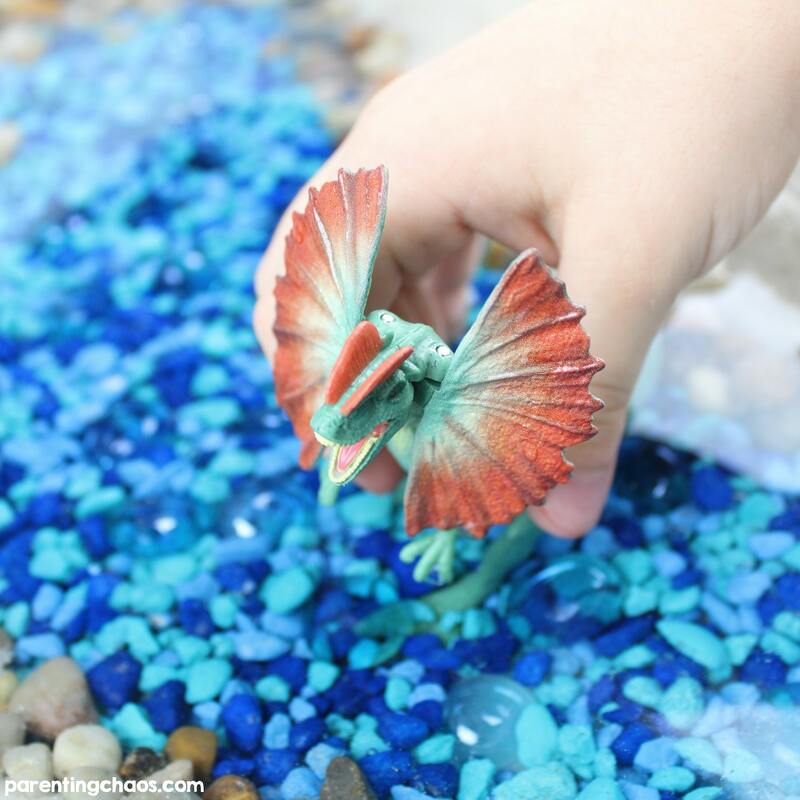 We have also included affiliate links above that lead to the exact supplies that we used when creating this sensory bin. Note: Don’t have dinosaurs in your home or center and don’t want to purchase them? 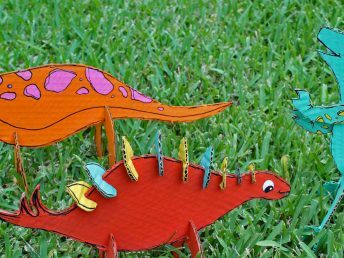 Head over to our Cardboard Dinosaur Craft and have kids create their own dinosaurs for this small world! 1. Add sand to a large bin. We have found that a large under the bed plastic bin is the cheapest and best option for a sensory bin or small world. Plus they come with a lid that makes them easy to store so you can play over and over again! 2. Add a bit of water to the sand and mix it up. You don’t want to add so much that you make mud – just enough to make the sand moldable. You could also substitute out sand with our DIY Taste Safe Moonsand Recipe. If you use moonsand you will not need to add water. 3. Form a space in the middle of the bin where the river will go. 4. Layer blue gravel in the empty space. Line the edges of the sand with small rocks. 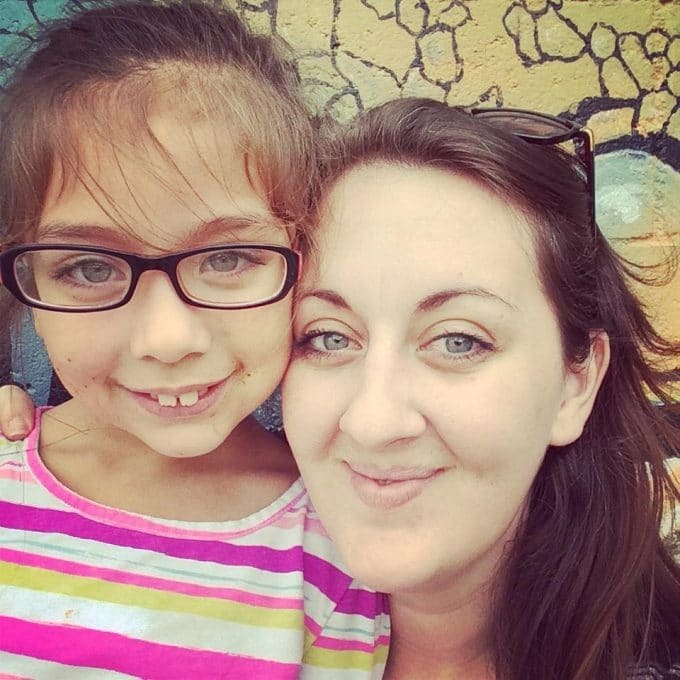 If you have a small child that still mouths items consider using taste safe water beads instead. We have an entire tutorial available for you here on how to make them. 6. Add a small nest and eggs, leaves, sticks etc. Building the dinosaur nest could be another activity on it’s own! 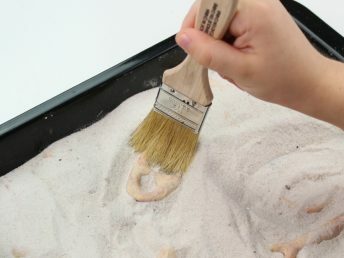 You can learn about how we made ours in our Build a Dinosaur Nest Science and Nature Challenge! 7. Add a small amount of water to the river. The amount will vary based on the size of your bin. You want to give your kids enough water to explore without flooding the dinosaur small world. 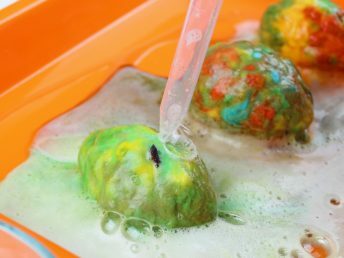 If you are using taste safe water beads skip this step – it will just make a mushy mess. 8. Then add in the dinosaurs and you are good to go! As you play with this bin allow your child to lead the discussion and the play. And don’t forget to have fun! Not making this dinosaur small world right this second? Then pin this post so you can easily find it later!